To celebrate the 14 May release of Sherlock Holmes: A Game Of Shadows on Blu-ray Triple play, DVD and digital download, the nation’s sleuthing skills were put to the test yet again today with the Urban Camouflage Challenge. Budding detectives were asked to solve three conundrums which appeared on Stephen Fry’s Twitter feed, Play’s Facebook page and IGN UK’s Twitter feed, leading them to a secret location in a major UK city, where they would have the chance to win a brand new iPad. 1. For riddle two I’ll speak to you, In language less Enochian. 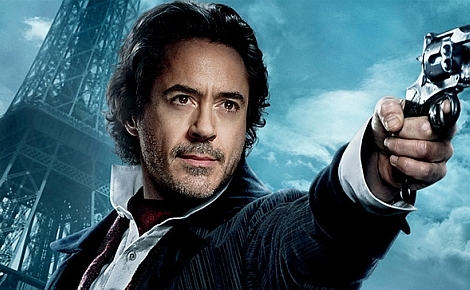 Dressed black as slate, I lie in wait, Near statue most Sherlockian. 2. Here in the north, beside the firth, where tattooed soldiers stand. Two Arthurs here: one bold and sheer, the other’s in the Strand. 3. Refuse output – the game’s afoot and now the foot’s the game. But don’t go far, I’m near the bar, that bears my writer’s name. The first person to get to the location and utter the winning words “My curse is I see everything” was 21 year old Edinburgh University student, Will Males. 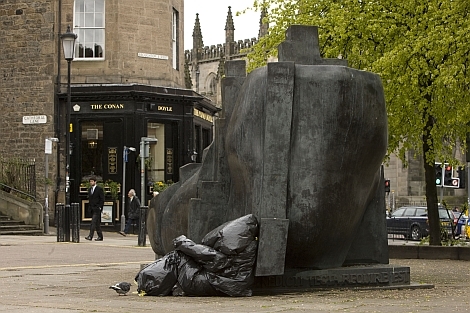 When he arrived at The Conan Doyle Pub, a Sherlock Holmes inspired artist was utilising his legendary camouflage abilities to blend into his surroundings, concealed as a pile of bin bags next to the statue, just across from the pub. Will is studying Linguistics at Edinburgh University, which perhaps explains how he deciphered the conundrums so quickly. There’s still one more chance to play the Urban Camouflage Challenge on 14 May, which is when the film is launched on home entertainment. For full details on how to play visit this site.